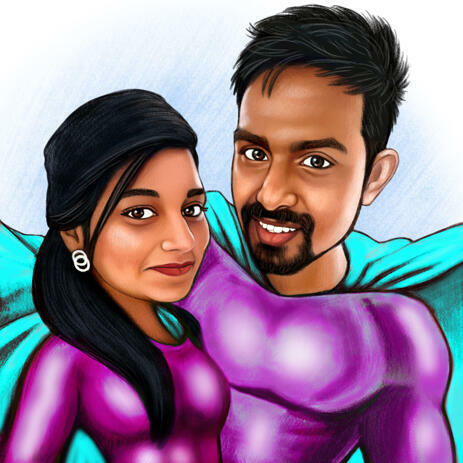 Get a funny cartoon drawing on 2 persons like lovely couples, friends, colleagues or spouses which will be drawn in any random superhero costumes. Caricature will be drawn in colored pencils style on original A4 or A3 Paper, which will be available for shipping. Cartoon drawing of your couple will make a great gift idea for your soul-mate on any occasion like Birthday, Wedding Anniversary or Valentine's Day as well as it can be used for a home decor. Couple Cartoon Drawing in Superhero costumes on demand will be delivered as a printable JPEG File on Email. Your ready-made cartoon drawing is available for shipping in other delivery options like Canvas Print, Photo Print, Mugs, Puzzles, Pillows and any other. All products can be shipped worldwide.